Television credits for Geoffrey Burgon include the music for Brideshead Revisited and the pop chart-topping Nunc dimittis (recorded here) which introduced the BBC’s John le Carré adaptation Tinker, Tailor, Soldier, Spy in 1979. But commercial success should not prevent us from recognizing, and appreciating, a depth of invention and mastery of formal conception which might just as well be described as being firmly rooted in the classical tradition, and particularly that of the Anglican Church. It is unlikely that Geoffrey Burgon will ever be caught arguing on the side of those who insist that ‘high’ art, especially in the form of contemporary classical music, is intrinsically superior to arts with genuine mass appeal. The evidence of his work as a composer suggests that Burgon’s aesthetic compass is readily set towards the popular. It also underlines the value he places on crafting accessible music. ‘I wrote accessible music simply because it was the way that the music wanted to come out’, he says; ‘it was never a conscious decision’. Closer analysis of his output, however, reveals a depth of invention, formal command and quality of craftsmanship securely rooted in what might fairly be described as the classical tradition. Born on 15 July 1941 near the Hampshire village of Hambledon, where the laws of cricket were formalized in the late eighteenth century, Burgon eventually discovered a passion for music as a pupil at Pewley Grammar School, Guildford. Several postmodern critics have dissected an apparent post-war phenomenon of ‘grammar school music’, drawing a partial picture of clever-clogged disciples of avant-garde modernism, hostile enemies of English parochialism and artistic insularity. Instead of looking to European iconoclasts such as Boulez and Maderna for a lead, young Geoffrey Burgon connected with American jazz and its imaginative reinvention in the fresh sounds of Miles Davis and John Coltrane. At the age of fifteen he produced his first notes on the trumpet as a self-confessed late starter and played in the Guildford School of Music orchestra. He taught himself to read music and wrote a song based on a poem by his closest school chum. Burgon swiftly picked up the harmonic foundations of jazz improvisation and progressed to gain a place at the Guildhall School of Music and Drama. He was determined to become a jazz trumpeter; however, the Guildhall School’s audition panel proved more interested in his portfolio of compositions than his instrumental performance. When he arrived at the Guildhall, composition had been preordained as his principal study. Burgon gained confidence from lessons with Peter Wishart, a pupil of Nadia Boulanger whose fluency in writing for voices, deceptive simplicity of musical language and background as a practical musician clearly suited his jazz-playing student’s nature. The student canvassed his teacher’s opinion about whether he might be able to make the grade as a composer. Wishart’s reply—‘You don’t seem to be able to stop!’—was enough to set Burgon on his path. Upon leaving college to pursue a freelance trumpeting career, Burgon briefly took private lessons with Lennox Berkeley, another product of the Boulangerie. Berkeley’s gentle encouragement was notably free of ‘thou shalt not’ commandments, although his erstwhile student recalls that he picked up little from him that he hadn’t already learned under Wishart. At Wishart’s suggestion, Burgon composed his first choral piece in 1964. Three Elegies was taken up by the BBC Chorus. This short unaccompanied work paved the way for a series of choral compositions bridging a four-decade span. Not long after the premiere of Three Elegies, Burgon’s friend David Gedge asked for a simple Mass setting for use by his choir at Brecon Cathedral. The Short Mass, completed in July 1965, captures something of the unaffected devotional spirit of Britten’s Missa brevis. Burgon’s syllabic setting of the Latin Mass text, the work’s use of concordant harmonies and its largely homophonic texture were in tune with ideals established for church music during the Second Vatican Council and comparable trends within the Anglican Church during the early 1960s. The brief embellishments and alternating paired voice parts in the Agnus Dei, however, echo a long-distant English choral technique regularly employed in the late fifteenth century. The young composer here balances the demands of changing liturgical practices with the legacy of tradition, a neat achievement for a creative artist who later avowed a deep dislike for organized religion. His writing, especially in the brief yet highly charged Benedictus, manages to sound both timeless and strikingly modern, a condition common to much of Burgon’s substantial output of music for choir. ‘The emotional content of jazz really got inside me when I was young. I then discovered J S Bach and was overwhelmed by the perfect balance of passion and intellectual integrity of his music.’ The models of Stravinsky and Britten also infused Burgon’s musical language, as did his study of works by medieval composers, Machaut among them. In 1971, Burgon, by now married and with two children to support, decided to abandon trumpet-playing in favour of a full-time career as composer. The move was financially extremely risky, but it was eased by commissions for television soundtrack scores and, initially, by a series of ballet scores, the first of which were for The London Contemporary Dance Theatre and Ballet Rambert. The Calm, choreographed by Siobhan Davies in 1974, received over one hundred performances and, in company with other dance scores, supplied Burgon’s first source of regular income from composition. His name appeared on the credits for a single episode of Doctor Who (Terror of the Zygons) in 1975. By popular demand, Burgon was engaged for another show in the same Doctor Who season of the cult BBC programme and also for a dramatization of M R James’s ghost yarn The Treasure of Abbott Thomas. International success with Tinker, Tailor, Soldier, Spy led to another high-profile BBC contract in 1980 for Testament of Youth, before Granada Television shrewdly appointed Burgon for its adaptation of Brideshead Revisited. His name appeared with increasing regularity on concert programmes, attached to works which attracted favourable criticism. The composer’s list of commissions expanded at a time when new tonal music remained beyond the pale for many of the gatekeepers responsible for promoting contemporary classical music. Of flowers and emeralds sheen uses Roy Campbell’s flowing interpretation of the thirtieth stanza of A Spiritual Canticle of the Soul and the Bridegroom Christ, which encapsulates the coruscating intensity of St John’s original verse. Written for the Choir of St Paul’s Cathedral in 2004 and dedicated to its then director of music, John Scott, Burgon’s unaccompanied four-part setting revels in the poem’s corporeal imagery. The ambiguity inherent in the words is reflected in the opening harmonies and the deliberate collision of two contrasting minor triads or minor seventh chords in the lower and upper voice parts. Burgon’s compositional strategy leads to a hypnotic solo setting of ‘Scorn not my humble ways’. It is hard to think of a more sensual conclusion to a sacred piece than that forged for Of flowers and emeralds sheen, or a text more suited to such treatment. The English Metaphysicals, notably John Donne, have contributed another fruitful source of texts for Burgon’s choral music. At the round earth’s imagined corners shares certain overt elements in common with his later Nunc dimittis setting, exploring the effective partnership of solo treble and organ graced by trumpet fanfares and interludes. The work, written in the summer of 1971 for his Guildhall School trumpet teacher Bernard Brown and his duo partner Felicity Palmer, opens with a simple melodic exchange between organ and muted trumpet. Burgon swiftly unfolds the notes of a C major triad across the treble’s first entry, engaging the stability of one of Western music’s basic building blocks as foundation for his contemplation of ‘the round earth’s imagined corners’. A swift central section, cast predominantly in triple time, sets out the catalogue of man’s mortality and God’s permanence. Purcell’s ghost appears to hover approvingly over the lean, penitential closing treatment of ‘here on this lowly ground’. Donne’s Death be not proud demands and receives a humble musical setting. Burgon’s anthem dwells on the transitory nature of sound itself, emerging from a single organ note to build a ‘pealing’ texture of sustained chords crowned by bell-like descending scales in the top treble part. The Nunc dimittis trio of organ, solo trumpet and treble is revived for the work’s brief central section, modified with the addition of a second solo treble to articulate the words ‘And better than thy stroke’. Death’s own mortality turns on a striking and sudden modulation, like an act of banishment, from a tonality implicitly rooted in F major to the remote region of E flat minor. Death be not proud was written at John Scott’s suggestion as a work for Remembrance Sunday. It was first performed in November 2005 by Wells Cathedral Choir and Matthew Owens together with its companion piece, Come let us pity not the dead. The latter takes its text from the collected works of Drummond Allison, published a quarter century after the poet was killed in action in Italy in December 1943. ‘My friend Peter Porter introduced me to Allison’, Burgon recalls. ‘Come let us pity not the dead is a powerfully moving text, especially when you realize that its author died at such a young age during the war.’ The composer’s economy of writing allows Allison’s plea to pity Death but not the dead to speak from the beyond the grave. In July 1987 Burgon completed his longest work for choir since The Fire of Heaven fourteen years earlier. The song of the creatures was commissioned for the Choir of St Matthew’s Church, Northampton, begetters of a remarkable series of miniature choral masterpieces by, among others, Britten, Berkeley, Kenneth Leighton, Edmund Rubbra and Gerald Finzi. Its form frames and articulates the canticle attributed to St Francis of Assisi, supposedly written by him while he ‘lay sick at Saint Damiano’. The saint’s song is delivered from the perspective of a blind man, unable to see the sun but as sure of its presence as he is of the splendour of God’s creation. Burgon’s litany of praises eventually settles on an instantly memorable hymn-like tune, itself prefaced by a majestic organ outburst and quietly revealed by a succession of unison trebles and tenors. An animated version of the same melody for a duet of solo treble and tenor gives way to a heartfelt choral benediction for those who ‘find themselves in thy most holy will’ and a return to the unison writing of the work’s opening. This disc contains two of Burgon’s four unaccompanied settings of late medieval English lyrics, collectively entitled Christ’s Love. The Assumption and The Corpus Christi Carol date from 2001 and show the aptness of the composer’s writing for choir. Each of the four voice lines of The Assumption, for example, is eminently singable, although their combined effect greatly exceeds the sum of the work’s parts. The Corpus Christi Carol’s early sixteenth-century text does not lack strong choral settings. Burgon’s version establishes its distinct individuality from the off with an imaginatively crafted treble solo, complete with an augmented fourth interval; likewise, the harmonies employed for the carol’s ‘Lully, lulley’ refrain sound freshly minted and novel. Once again, the composer raises simplicity of texture to a virtue that allows the compelling narrative of his chosen text to flow unimpeded. Adam’s fall and the corruption of paradise are central concerns of The First World, a diptych for unaccompanied choir infused with bold chromatic harmonies and delicate alterations of timbre and texture. Harmonic uncertainty prevails throughout As the angels stood. Anna and Clare Needham’s aphoristic verse, written during their childhood, is delineated by a call-and-response structure in which divided choral voices represent the company of angels and a tenor soloist projects the serpentine villain’s beckoning call. The mood changes to one of defiance at the opening of Apple Blossom. Louis MacNeice’s exquisite reflection on Adam and Eve’s expulsion from Eden is complemented by Burgon’s return to ancient precepts of composition. The text’s syllabic treatment and its initial division into short-breathed phrases recall the style, if not the sound, of early conductus, while the subsequent development of a recurring tune that migrates upwards through the voice parts from tenor to treble is reminiscent of a much-used medieval cantus firmus technique. Burgon’s Magnificat, written in 1979 as a natural companion for his Nunc dimittis, was created for the Royal Choral Society and its chief conductor Meredith Davies. The organ’s flamboyant melodic riff, which supplies the anthem’s unifying feature, bears more than a passing resemblance to the late medieval estampie, a wild, dance-like instrumental form; likewise, the initial parallel fifths and brief canonic exchanges between the divided trebles bear ancient ancestral roots. Burgon returned to the Anglican Book of Common Prayer in 2002 for his Te Deum and in his alert, insightful response to the text proved the natural heir to Britten and Walton. The service anthem opens not with a bang but a gentle affirmation of faith that builds to a hymn of praise punctuated by an unexpected ninefold acclamation of the word ‘Holy’. 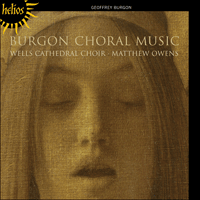 Syllabic setting, as in so many of Burgon’s choral works, etches the spirit and sense of the words of those queuing to praise God’s infinite majesty.